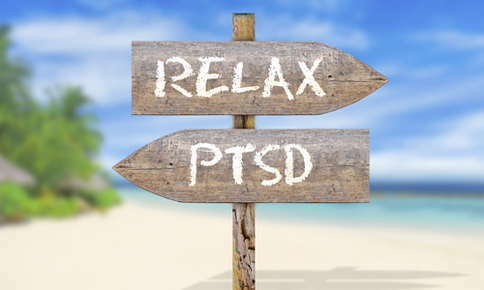 It's difficult to feel centered and in control of your body when you have post-traumatic stress disorder (PTSD). A sound, a smell, even a particular word, can immediately transport you back in time. Yoga, a form of exercise that combines physical movements with a spiritual component, can help you prevent or reduce flashbacks and relieve stress and anxiety. Yoga involves much more than standing on your head or twisting your body into complicated poses. The creators of this ancient practice believed that achieving harmony between your mind and body was the key to good physical and mental health. They developed a series of poses designed to stretch and tone the body and coupled them with calming deep breathing exercises and meditation. Today, yoga is regarded as an effective way to lower stress, decrease depression, improve strength, reduce high blood pressure, ease aching joints and prevent insomnia. Requiring You to Be Fully Present. Focusing on the present not only improves your yoga practice but may also reduce flashbacks. As you switch from one pose to another, you'll focus on your breathing and the sensations you feel as you move your body. Reducing Stress and Anxiety. It's not unusual to feel constantly on edge if you have PTSD. Breathing slowly and deeply as you perform poses will help you relax. Meditation, an important component of yoga, enhances the calming effect. If you begin to feel stressed, a little deep breathing or meditation may be enough to reduce your heart rate and prevent negative self-talk from taking over your brain. Over time, you may feel calmer even when you're not practicing yoga. Allowing You to Feel In Control of Your Body. If your post-traumatic stress was triggered by an incident that involved assault or a physical injury, you may feel as if you have no control over your body. Learning and perfecting new poses is only possible by purposefully moving your body. As you become more adept at yoga poses, you may begin to feel more in control. Preventing Sleep Problems. Insomnia and other sleep difficulties are an unfortunate consequence of PTSD for many people. Unfortunately, the less sleep you get, the worse your symptoms. Because yoga reduces your overall stress level, you may find that it's easier to fall asleep and stay asleep. If you do happen to wake up during the night, a few minutes of deep breathing or meditation can help you drift off to sleep again. Is Yoga Really Effective for PTSD? Several studies conducted on the effectiveness of yoga for PTSD have produced promising results. One study detailed by the Trauma Center at Justice Resource Institute involved 64 women with PTSD who hadn't been helped by other treatments. After completing 2 1/2 months of yoga classes, 52 percent of the women no longer met the criteria for the disorder. Even the U.S. military recognizes that performing yoga is very beneficial for people who have PTSD. Its iRest protocol uses yoga nidra, a form of the practice that focuses on deep relaxation. Sessions include guided meditation designed to decrease negative thoughts and sensations, and modify the control response to PTSD triggers. There are many different types of yoga and yoga classes. If you don't like a particular class or style of yoga, try another. Your instructor can help you find the class that's best for you. Yoga instructors may lightly touch your body to help you learn the proper form. If being touched triggers you, be sure to let the instructor know that you do not want to be touched. Some poses can also be triggering for people who have PTSD. If you don't feel comfortable performing a certain pose, feel free to perform one that helps you feel calm and centered instead. As you progress in your yoga practice and your PTSD symptoms decrease, you may find that the pose no longer bothers you. Does it seem as if nothing you do relieves your PTSD symptoms? Yoga may offer the solution you've been seeking. Call us today to learn more about yoga and the classes we offer.